So the third season of Voltron: Legendary Defender felt unusually short and even a little underwhelming, but that's what you get I suppose. More and more I'm feeling that the show is somewhat on thin ice as they're cutting it up in this manner as the combined episodes of Seasons 3 and 4 really could have constituted a full season together. Instead we have two bits that don't quite feel as strong as the second season. But there's still a lot of good reasons to keep watching the show as they have taken the franchise into an interesting direction even though it's pretty far away from how the original story went. And being different isn't a bad thing in this case as they've certainly taken steps to truly enrich the back stories of different characters to make something pretty unique. 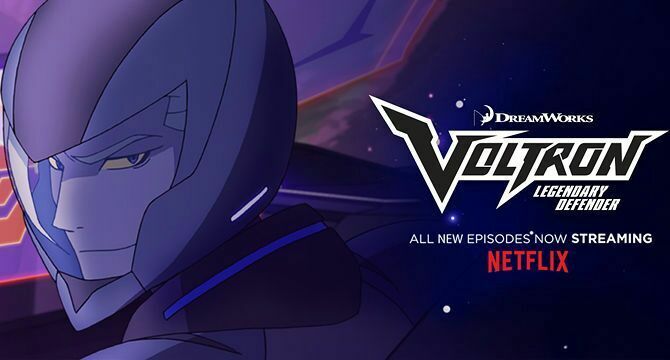 Synopsis: Voltron: Legendary Defender is animated television series as produced by DreamWorks Animation and World Events Production for Netflix. The show has broadcast its fifth season already with a similarly short season six in the works. So the season begins with Keith (Steven Yuen) still working with the Blade of Marmora instead of being with the Voltron team. For some reason he's more interested in these espionage missions instead of leading the Voltron team. But push comes to shove and the Voltron team find themselves needing to go back into battle without Keith and Shiro (Josh Keaton) ends up begging the Black Lion to allow him to pilot it again. The season doesn't have much time to tell stories and so they need to hit things pretty hard and fast. So Pidge (Bex Taylor-Klaus) decides to finally look for her brother Matt on her own. Emperor Zarkon (Neil Kaplan) is finally well enough to reclaim the Galra throne and opts to relieve his son Prince Lotor (A.J. Locascio) from his duties. And the Witch Haggar (Cree Summer) continues to view the prince with suspicion while she continues to care for Zarkon's well-being. What I Liked: Keith wanting to find a life of his own was a little weird to me at first but it did provide for a clever way to resolve the silent power struggle of who should lead the Voltron team given Shiro's return last season. And let's face it - the Blade of Marmora is quite the fascinating group of pseudo alien ninjas bringing the fight directly to the Galra perhaps more than Voltron has for most of the season. And I liked the stress that Voltron is but one part of a larger coalition of alien races banding together to face the Galra Empire. That just underscores the threat that the Galra represent more than any other in the franchise's history. This is not some comical episodic villain that just sends a new monster Voltron's way every week. What Could Have Been Better: I know the show loves to have it's comical bits but some things were just too crazy. The repeated need for Team Voltron to go on press tours in order to drum up support for the coaltion is getting really old and I wish it didn't get as much focus as it does in these very short seasons. To have a whole episode of antics with Coran (Rhys Darby) being somewhat mind-controled was really too much. And then there's the whole concern about the brevity of these seasons that still continues to nag at me. Why are we forced to settle for these half-seasons posing as full seasons? What kind of stories can we really tell in so short a span of time? I've praised briefer storytelling in the past, but the sheer scale of the story they've been aiming for with Voltron does not fit the season durations they're working with and maybe a shift in direction is in order. But it looks like we're locked into this pattern until at least season 6 so we're stuck for now. TL;DR: Voltron: Legendary Defender tries to do its best with the limited runway that it has but I can feel the show is straining at the edges of what can be done. But we make the most of what's there and hold on until the next brief season. Thus this fourth season gets a good 3.5 alien races joining the coalition out of a possible 5.